Revathy Kalamandir Film Academy in association with Manorama Yuva organises a 24 Hour Film Rush Contest 2017 on 13th to 14th May 2017. 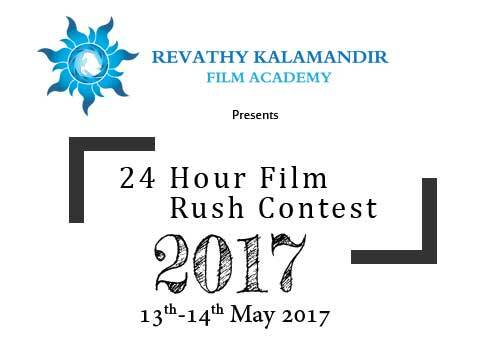 The contest is exclusively for students or professionals in media and film where the participants have to script, direct, shoot, edit and mix the short film within 24 hours from the time the concept/theme of the short film is announced. All selected short film team members will be given a certificate of participation. The winning team will be awarded prize money. Winners will get a prize money worth Rs. 75000, second prize of Rs. 50,000 and audience poll winners will get a prize money of Rs. 25000.